Before :- B. Sudershan Reddy and Deepak Verma, JJ. For the Appellant :- Mr. D. Mahesh Babu, Advocate. For the Respondent :- Mr. S.K. Dubey, Sr. Advocate with Mr. Rajesh, Dharam Singh and Yogesh Tiwari, Advocates. 1. If a Muslim woman has been divorced, she would be entitled to claim maintenance from her husband under Section 125 of the CrPC after the expiry of period of iddat also, as long as she does not remarry. 2. Petition under Section 125 of the CrPC would be maintainable before the Family Court. 2001(4) RCR(Criminal) 468 (SC) and 2007(3) RCR(Criminal) 297 : 2007(3) RAJ 447 (SC) relied. 1. The purpose of enactment was essentially to set up family courts for the settlement of family disputes, emphasizing on conciliation and achieving socially desirable results and adherence to rigid rules of procedure and evidence should be eliminated - In other words, the purpose was for early settlement of family disputes. 1. Danial Latifi v. Union of India, 2001(4) RCR(Criminal) 468 : (2001)7 SCC 740. 2. Mohd. Ahmed Khan v. Shah Bano Begum, 1985(2) RCR(Criminal) 136 : (1985)2 SCC 556. 3. 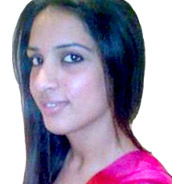 Iqbal Bano v. State of U.P., 2007(3) RCR(Criminal) 297 : 2007(3) RAJ 447 : (2007)6 SCC 785. 4. Vijay Kumar Prasad v. State of Bihar, 2004(2) RCR(Criminal) 470 : 2004(2) Apex Criminal 618. Deepak Verma, J. - Leave granted. 2. 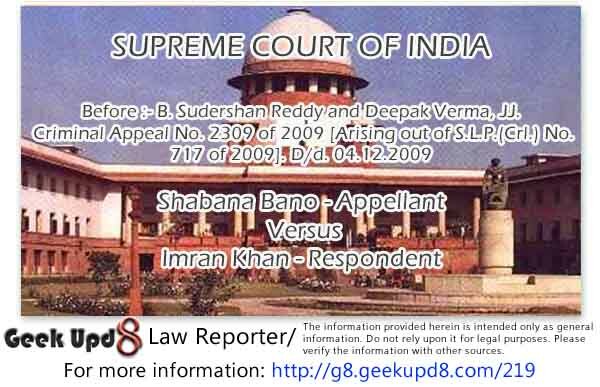 Appellant Shabana Bano was married to the respondent Imran Khan according to Muslim rites at Gwalior on 26.11.2001. According to the appellant, at the time of marriage, necessary household goods to be used by the couple were given. However, despite this, the respondent-husband and his family members treated the appellant with cruelty and continued to demand more dowry. 3. After some time, the appellant became pregnant and was taken to her parents' house by the respondent. The respondent threatened the appellant that in case his demand of dowry is not met by the appellant's parents, then she would not be taken back to her matrimonial home even after delivery. 4. Appellant delivered a child in her parental home. Since even after delivery, respondent did not think it proper to discharge his responsibility by taking her back, she was constrained to file a petition under Section 125 of the Code of Criminal Procedure (for short, 'Cr.P.C.') against the respondent in the Court of Family Judge, Gwalior. It was averred by the appellant that respondent has been earning a sum of Rs. 12,000/- per month by doing some private work and she had no money to maintain herself and her new- born child. Thus, she claimed a sum of Rs. 3000/- per month from the respondent towards maintenance. 5. On notice being issued to the respondent, he denied all the contents of the petition filed by the appellant under Section 125 of the Cr.P.C. except admitting his marriage with the appellant. 6. Preliminary objections were raised by the respondent that appellant has already been divorced on 20.8.2004 in accordance with Muslim Law. Thus, under the provisions of Muslim Women (Protection of Rights on Divorce) Act, 1986 (hereinafter referred to as 'Muslim Act'), appellant is not entitled to any maintenance after the divorce and after the expiry of the iddat period. It was also contended by him that appellant herself is earning Rs. 6,000/- per month by giving private tuitions and is not dependent on the income of the respondent, thus, she is not entitled to any maintenance. It was also contended by respondent that appellant had gone to her parental home on her own free-will and accord, after taking all the jewellery and a sum of Rs. 1000/- and despite notice being sent, she has not returned to her matrimonial home. Thus, for all these reasons, she is not entitled to receive any amount of maintenance. "(1) respondent shall pay Rs. 2000/- per month as maintenance allowance to the petitioner from 26.4.2004, date of institution of petition to the date of divorce, i.e. 20.8.2004 and thereafter from 20.8.2004 to the period of iddat. (2) respondent will bear cost of the suit of himself as well as of petitioner." 8. Thus, the claim of the appellant was allowed to the extent of Rs. 2,000/- per month towards maintenance from the date of institution of the petition till the date of divorce, i.e., 20.8.2004 and further from the said date till the expiry of iddat period but amount of maintenance thereafter was denied. 9. The appellant was, therefore, constrained to carry the matter further by filing Criminal Revision No. 285 of 2008 before the Gwalior Bench of the High Court of Madhya Pradesh. The said Criminal Revision came to be disposed of by learned Single Judge on 26.9.2008 and the order of the Family Court has substantially been upheld and consequently, the appellant's Revision has been dismissed. It is this order and the order passed by the Family Court which are the subject-matter of challenge in this appeal by grant of special leave. 10. At the outset, learned counsel for the appellant contended that learned Single Judge has gravely erred in dismissing the appellant's Revision on misconception of law on the ground that after divorce of a Muslim wife, a petition under Section 125 of the Cr.P.C. would not be maintainable. It was also contended that learned Single Judge proceeded on wrong assumption in dismissing appellant's Revision claiming maintenance under Section 125 of the Cr.P.C. It was also argued that both the courts below completely lost sight of the provisions of Section 7(1)(f) of the Family Courts Act, 1984 (hereinafter referred to as the 'Family Act'). 11. On the other hand, Shri S.K. Dubey, learned Senior Counsel for the respondent contended that no illegality or perversity can be found in the order passed by the learned Single Judge and the same calls for no interference. It was also contended that the appeal being devoid of any merit and substance, deserves to be dismissed. 12. In the light of the aforesaid contentions, we have heard the learned counsel for the parties and perused the records. 13. The basic and foremost question that arises for consideration is whether a Muslim divorced wife would be entitled to receive the amount of maintenance from her divorced husband under Section 125 of the Cr.P.C. and, if yes, then through which forum. Provided further that if any of the parents is unable to pay his or her share of the maintenance ordered by the Magistrate on the ground of his or her not having the means to pay the same, the Magistrate may, on proof of such inability being furnished to him, order that the share of such relatives in the maintenance ordered by him be paid by such of the other relatives as may appear to the Magistrate to have the means of paying the same in such proportions as the Magistrate may think fit to order. (2) Where a divorced woman is unable to maintain herself and she has no relatives as mentioned in sub-section (1) or such relatives or any one of them have not enough means to pay the maintenance ordered by the Magistrate or the other relatives have not the means to pay the shares of those relatives whose shares have been ordered by the Magistrate to be paid by such other relatives under the second proviso to sub-section (1), the Magistrate may, by order, direct the State Wakf Board established under Section 9 of the Wakf Act, 1954 (29 of 1954), or under any other law for the time being in force in a State, functioning in the area in which the woman resides, to pay such maintenance as determined by him under sub-section (1) or, as the case may be, to pay the shares of such of the relatives who are unable to pay, at such periods as he may specify in his order." 15. Section 5 thereof deals with the option to be governed by the provisions of Section 125 to 128 of the Cr.P.C. It appears that parties had not given any joint or separate application for being considered by the Court. Section 7 thereof deals with transitional provisions. 16. Family Act, was enacted w.e.f. 14th September, 1984 with a view to promote conciliation in, and secure speedy settlement of, disputes relating to marriage and family affairs and for matters connected therewith. 17. The purpose of enactment was essentially to set up family courts for the settlement of family disputes, emphasizing on conciliation and achieving socially desirable results and adherence to rigid rules of procedure and evidence should be eliminated. In other words, the purpose was for early settlement of family disputes. 18. The Act, inter alia, seeks to exclusively provide within jurisdiction of the family courts the matters relating to maintenance, including proceedings under Chapter IX of the Cr.P.C. (b) be deemed, for the purposes of exercising such jurisdiction under such law, to be a district Court or, as the case may be, such subordinate civil Court for the area to which the jurisdiction of the Family Court extends. "20. Act to have overriding effect - The provisions of this Act shall have effect notwithstanding anything inconsistent therewith contained in any other law for the time being in force or in any instrument having effect by virtue of any law other than this Act." 21. Bare perusal of Section 20 of the Family Act makes it crystal clear that the provisions of this Act shall have overriding effect on all other enactments in force dealing with this issue. 22. Thus, from the abovementioned provisions it is quite discernible that a Family Court established under the Family Act shall exclusively have jurisdiction to adjudicate upon the applications filed under Section 125 of Cr.P.C. 23. In the light of the aforesaid contentions and in view of the pronouncement of judgments detailing the said issue, learned counsel for the appellant submits that matter stands finally settled but learned Single Judge wholly misconstrued the various provisions of the different Acts as mentioned hereinabove, thus, committed a grave error in rejecting the appellant's prayer. "30. A comparison of these provisions with Section 125 CrPC will make it clear that requirements provided in Section 125 and the purpose, object and scope thereof being to prevent vagrancy by compelling those who can do so to support those who are unable to support themselves and who have a normal and legitimate claim to support are satisfied. If that is so, the argument of the petitioners that a different scheme being provided under the Act which is equally or more beneficial on the interpretation placed by us from the one provided under the Code of Criminal Procedure deprive them of their right, loses its significance. The object and scope of Section 125 CrPC is to prevent vagrancy by compelling those who are under an obligation to support those who are unable to support themselves and that object being fulfilled, we find it difficult to accept the contention urged on behalf of the petitioners. 31. Even under the Act, the parties agreed that the provisions of Section 125 CrPC would still be attracted and even otherwise, the Magistrate has been conferred with the power to make appropriate provision for maintenance and, therefore, what could be earlier granted by a Magistrate under Section 125 CrPC would now be granted under the very Act itself. This being the position, the Act cannot be held to be unconstitutional. 32. As on the date the Act came into force the law applicable to Muslim divorced women is as declared by this Court in Shah Bano's case [1985(2) RCR(Criminal) 136 : (1985) 2 SCC 556 Mohd. Ahmed Khan v. Shah Bano Begum & Ors.]. In this case to find out the personal law of Muslims with regard to divorced women's rights, the starting point should be Shah Bano's case and not the original texts or any other material - all the more so when varying versions as to the authenticity of the source are shown to exist. Hence, we have refrained from referring to them in detail. That declaration was made after considering the Holy Quran, and other commentaries or other texts. When a Constitution Bench of this Court analysed Suras 241-242 of Chapter II of the Holy Quran and other relevant textual material, we do not think, it is open for us to re-examine that position and delve into a research to reach another conclusion. We respectfully abide by what has been stated therein. All that needs to be considered is whether in the Act specific deviation has been made from the personal laws as declared by this Court in Shah Bano's case without mutilating its underlying ratio. We have carefully analysed the same and come to the conclusion that the Act actually and in reality codifies what was stated in Shah Bano's case. The learned Solicitor General contended that what has been stated in the Objects and Reasons in Bill leading to the Act is a fact and that we should presume to be correct. We have analysed the facts and the law in Shah Bano's case and proceeded to find out the impact of the same on the Act. If the language of the Act is as we have stated, the mere fact that the Legislature took note of certain facts in enacting the law will not be of much materiality." "10. Proceedings under Section 125 Cr.P.C. are civil in nature. Even if the Court noticed that there was a divorced woman in the case in question, it was open to it to treat it as a petition under the Act considering the beneficial nature of the legislation. Proceedings under Section 125 Cr.P.C. and claims made under the Act are tried by the same court. In Vijay Kumar Prasad v. State of Bihar, 2004(2) RCR(Criminal) 470 : 2004(2) Apex Criminal 618 : (2004)5 SCC 196 it was held that proceedings under Section 125 Cr.P.C. are civil in nature. It was noted as follows : (SCC p.200, Para 14). 14. The basic distinction between Section 488 of the old Code and Section 126 of the Code is that Section 126 has essentially enlarged the venue of proceedings for maintenance so as to move the place where the wife may be residing on the date of application. The change was thought necessary because of certain observations by the Law Commission, taking note of the fact that often deserted wives are compelled to live with their relatives far away from the place where the husband and wife last resided together. As noted by this Court in several cases, proceedings under Section 125 of the Code are of civil nature. Unlike clauses (b) and (c) of Section 126 (1) an application by the father or the mother claiming maintenance has to be filed where the person from whom maintenance is claimed lives." 26. In the light of the findings already recorded in earlier paras, it is not necessary for us to go into the merits. The point stands well settled which we would like to reiterate. 27. The appellant's petition under Section 125 of the Cr.P.C. would be maintainable before the Family Court as long as appellant does not remarry. The amount of maintenance to be awarded under Section 125 of the Cr.P.C. cannot be restricted for the iddat period only. 28. Learned Single Judge appeared to be little confused with regard to different provisions of Muslim Act, Family Act and Cr.P.C. and thus was wholly unjustified in rejecting the appellant's Revision. 29. Cumulative reading of the relevant portions of judgments of this Court in Danial Latifi (supra) and Iqbal Bano (supra) would make it crystal clear that even a divorced Muslim woman would be entitled to claim maintenance from her divorced husband, as long as she does not remarry. This being a beneficial piece of legislation, the benefit thereof must accrue to the divorced Muslim women. 31. As a necessary consequence thereof, the matter is remanded to the Family Court at Gwalior for its disposal on merits at an early date, in accordance with law. The respondent shall bear the cost of litigation of the appellant. Counsel's fees Rs. 5,000/-. An Advocate & law blogger from Delhi, India. She joined us in Law Reporter (a Geek Upd8 law project) in June,2013. She is very interested in criminal and cyber laws. Supreme court always gives judgment in masses favor.